Putting a gift voucher to good use, we spend our last morning of 2016 relaxing in the scenic surrounds of Rottnest Island. Boarding the first ferry from B Shed in the Fremantle Port at 7.15 am, the journey is fairly uneventful as we travel the open seas and past some gigantic looking container ships. Before we know it, we are stepping onto the ferry landing. For $30.00 we bought along our own bikes to ride around, however if you don’t have a bike, Rottnest Express offer an easy hire service bookable online and all ready at the ferry landing for collection. Equipped with backpacks and the sunshade tent attached to the bike basket, we pedal to the main settlement in search of some fruit and beer. A weird combination that may be, however as we were carrying everything else these final items would complete our day packs. 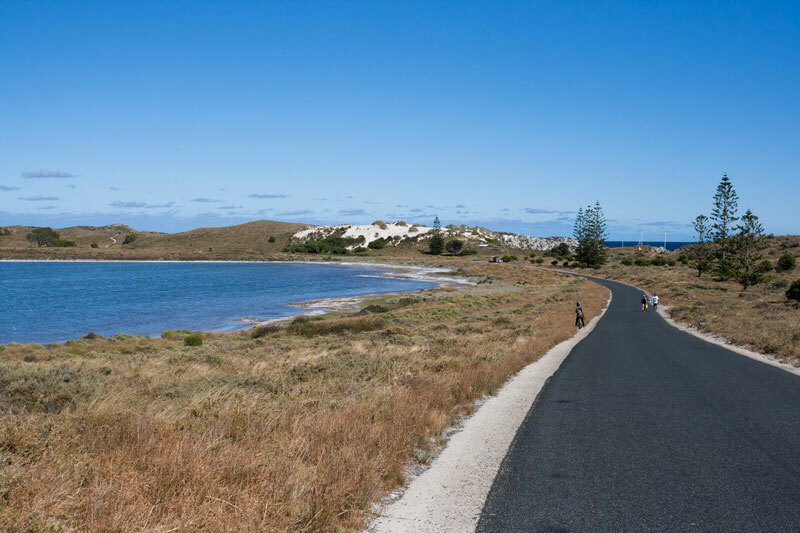 Western Australia’s Rottnest Island is car free and a path extends to a number of scenic spots around the 10.5 km long island, giving visitors the luxury of swimming and exploring many bays and coves. 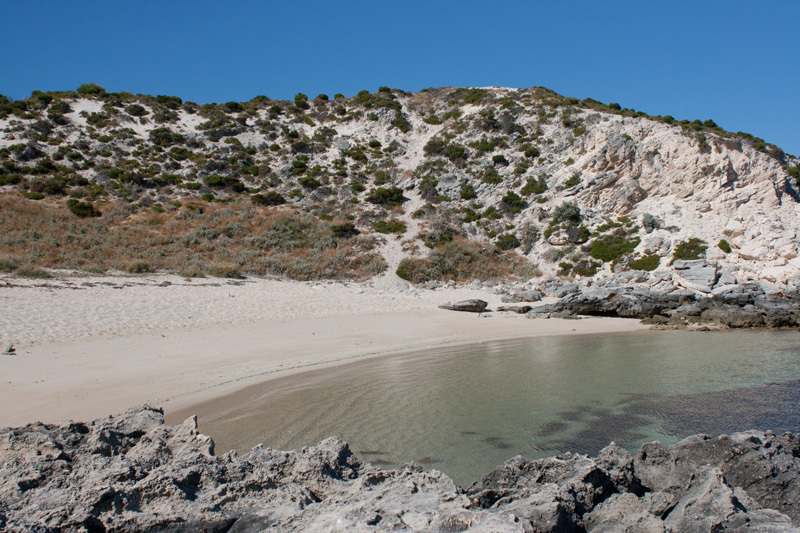 In addition to cycling there is a network of hiking trails too, called Wadjemup Bidi. If you don’t cycle or hike, there is an island bus to all of the vantage points. 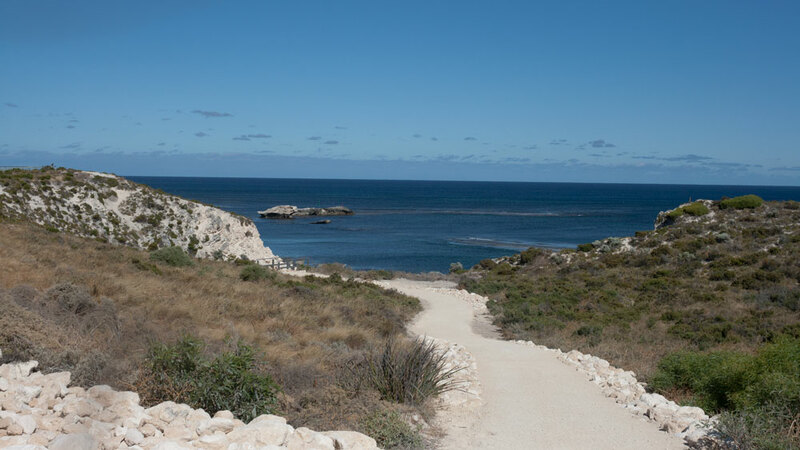 Outdoors enthusiasts and anyone who enjoys a slower pace will probably love the Rottnest experience the most and I’ll explain just why in this post. Leaving the breakfast run back at settlement we cycle under the trees along Kings Way, passing the Country Club and Golf Course. Views of the blue Indian Ocean appear when we approach The Basin, a popular swimming spot with shelter, toilets and a small grassed area. 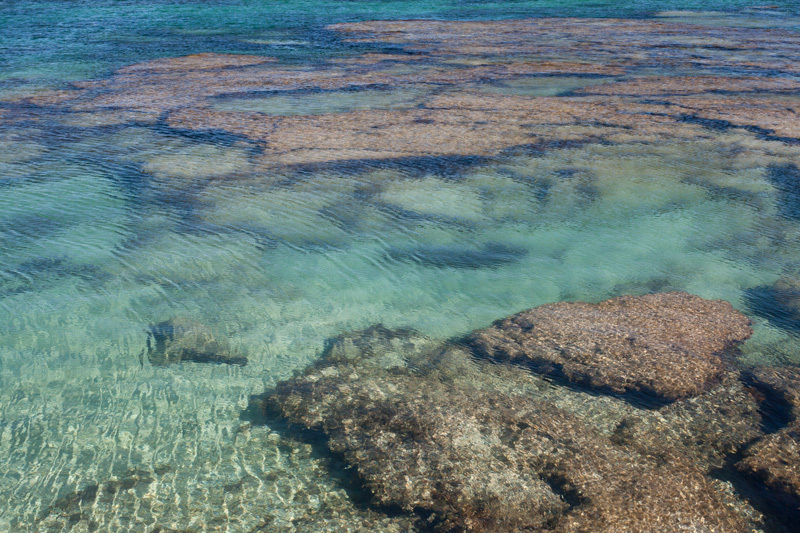 Not to mention beautiful shallow clear waters. We continue cycling, through Geordie Bay, with holiday units, a general store and cafe. Lake Baghdad appears on the left and the view opens across heathland and some random non native Norfolk Pines. I am curious as to the significance (if any) behind the name for Lake Baghdad. As we enjoy a great downhill strip, the opposite can be said about the couple who pass us climbing the hill towards settlement. Between two hills we see Perth’s city skyline in the far distance. 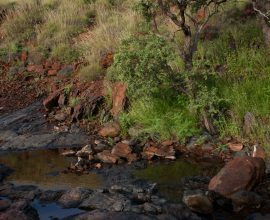 Near Armstrong hill, we veer off the main path to check out Little Armstrong Bay. Greeted with peaceful surrounds, we decide this will be the place to set up for a couple of hours. As we lock the bikes I notice a trail head for hiking, thinking it would be good to walk along if the wind picks up and becomes uncomfortable on the beach. Little Armstrong Bay is one of a few areas around the island reserved as a marine sanctuary zone where fishing is prohibited. Close to shore there are various limestone reefs to snorkel and a little further out, the sea floor drops significantly providing an even better spot for experienced swimmers and divers. The Leeuwin current brings tropical fish species close to the island, many more than you would find off Perth beaches. We are the only people here, however this will change later in the day being New Years Eve. At 9:00 am the stir of a light wind ripples the flat ocean surface, this isn’t a surprise having seen the high windy forecast before leaving Fremantle. That’s okay because the sun is out. We set up our trusty beach tent in a small sandy opening, a little further away from the bay. It is low tide and quite calm. We’re not really into sun bathing so the beach tent is a great asset for summer trips like these, extending our time by the sea in a shaded spot as well as providing a place to keep our picnic supplies cool. I love the beach tent, so far we have enjoyed 4 years use of it! The photos will not tell you the water is cold however I will tell you the water is ice cold. Welcome Swallows fly and chirp around us, skimming the water, landing on rocks close by but not close enough. Now I know why they are named Welcome Swallows, they certainly gave us a good welcome. 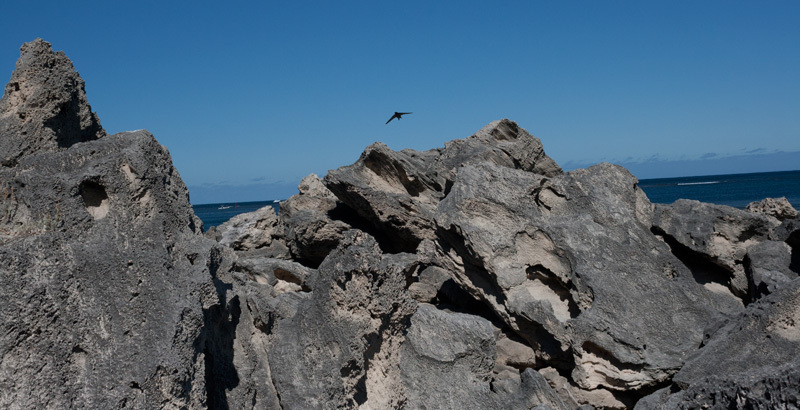 At first, it seems to be a harsh environment for this little swallow – salty water, exposed limestone cliffs and strong winds, however their wings are quite long and they are super fast and agile. 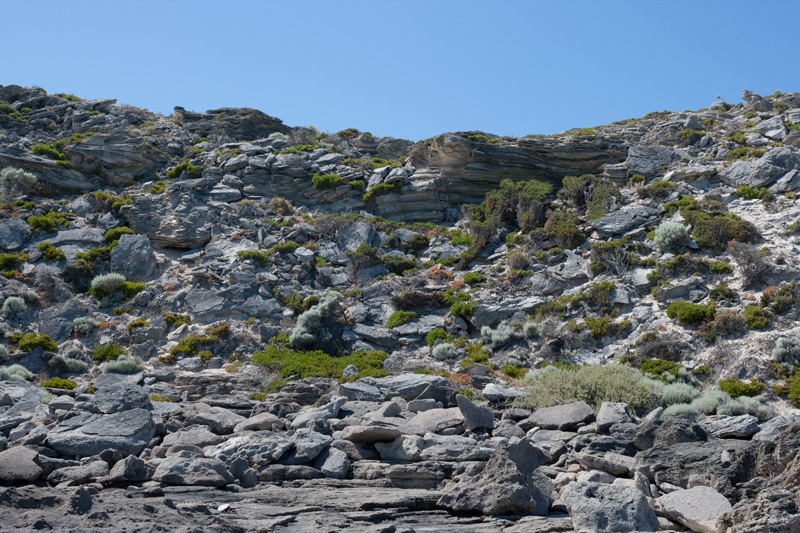 The coastal cliff carved by the ocean over time provides another perspective of Rottnest Island and is habitat to some birds. We spot an Eastern Osprey perched high on the rocks and unfortunately I wasn’t carrying the right lens to capture it. There is an undetermined population of Rock Parrots on the island, keep an eye out for this special bird and if you do spot it be sure to report the sighting as research is currently being undertaken to establish numbers on the island. Beyond the reef platform in front of us, the ocean is quite deep and as we take in the view, we see almost a highway of boats racing from left to right. 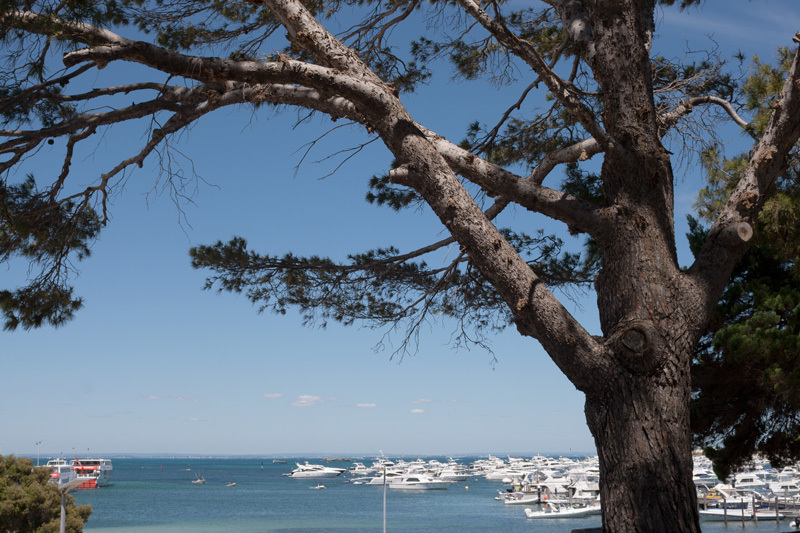 Rottnest is a hot spot for the local Perth boating folk and each time we visit it feels there are more and more boats around. Time flys by as we relax, explore the rocky area and snack. When we pack up and walk to Little Armstrong Bay, it’s alive with sunbathers, beach umbrellas and snorkelers. Returning to settlement we decide rather than trace the same journey taken to Little Armstrong Bay earlier, we pedal past the salt lakes using Defence Road. We pass six of the lakes as well as a small woodland section alive with bird calls. The lakes on Rottnest are quite significant in terms of the island’s natural environment, they contrast to the blue Mediterranean looking ocean and we learn their formation occurred from the collapse of caves. Local Jarrad Seng captured an amazing aerial of some of the lakes, which is below. Hope he doesn’t mind me using the picture! The lakes support a population of different bird species including migratory shore birds. Interestingly shore birds are quite different to sea birds, they travel for weeks across continents on a yearly migration and only go into water where they can touch the bottom – so low tide areas and lakes. Also explains the super long legs they have! 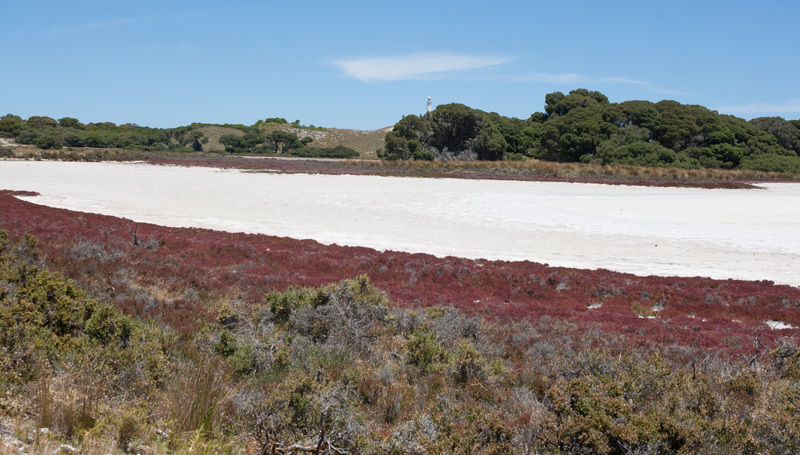 These salt lakes on Rottnest Island ensure their survival on that migration. Ann Jones wrote up an intriguing article not about Rottnest Island but the journey of the migratory birds here. Worth a read and definitely makes you stop and admire these birds if you are lucky to spot them on the island. 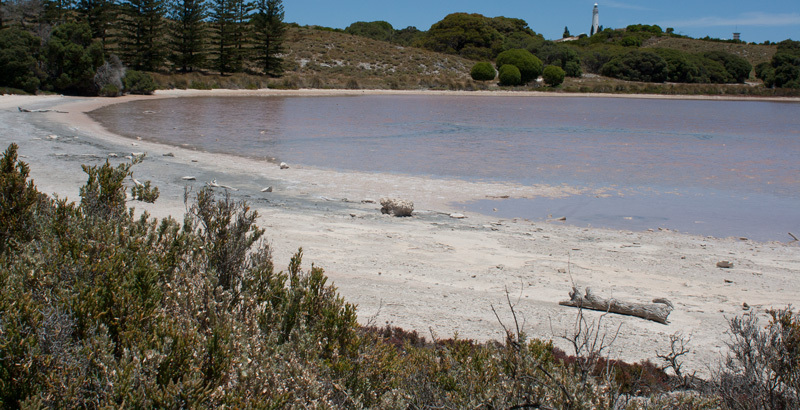 In summer, Pink Lake tends to dry out. We reach Digby Drive, with two choices, continue to the West End of the island which we visited on our last trip or return to settlement. With under two hours before our ferry departure we veer left towards settlement and away from the lighthouse. It’s a pleasant downhill past Herschel and Pearse Lakes. We see a group of ladies pulled up to the side of the road having a picnic near the lake, an unusual spot but it’s quite hot now and they have the right idea resting under the shade of trees. As our visit was technically free to the island, thanks to gift vouchers for the ferry rides, we decide to treat ourselves to pizza and a round of ice cold drinks from Hotel Rottnest, one of the drinking spots on the island. 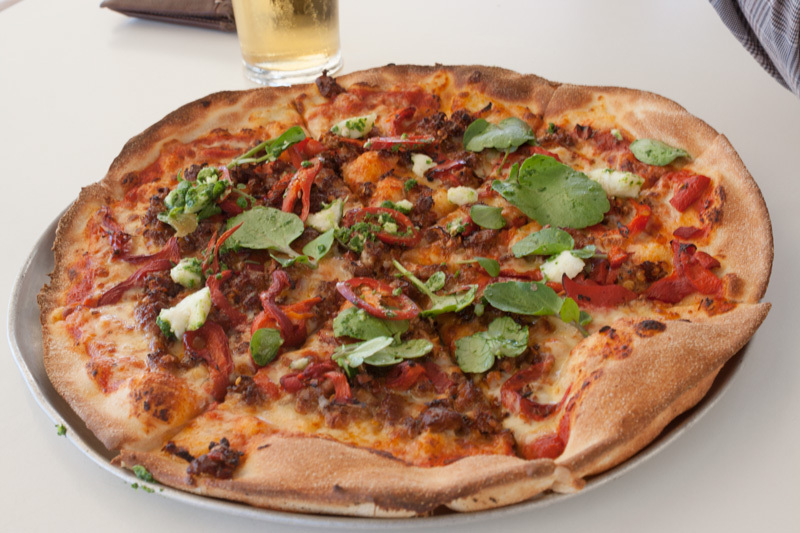 We order a ‘homemade spicy Italian sausage, tomato sugo, fire roasted capsicum, watercress, bocconcini, green pesto and sliced long red chilli’. When bought to the table I wonder – where were all the ingredients, back on the mainland? It was great to see Eagle Bay’s brew on the menu and sitting in the shaded beer garden was a well deserved break from the sun. 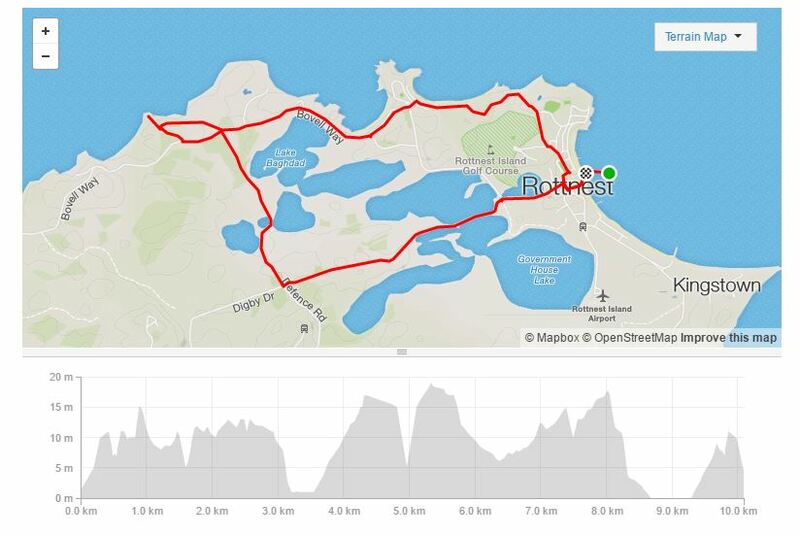 Below is a snap shot of the 10km ride using Strava’s free map your own route function. It was a relatively easy ride along the path which is suitable for all types of bikes. A couple of hills however there’s really no rush, is there? A much shorter ride than to the west end of the island and one that takes in a number of different landscapes with the potential to see plenty of bird life. If you have a whole day on the island, check out our other cycle. 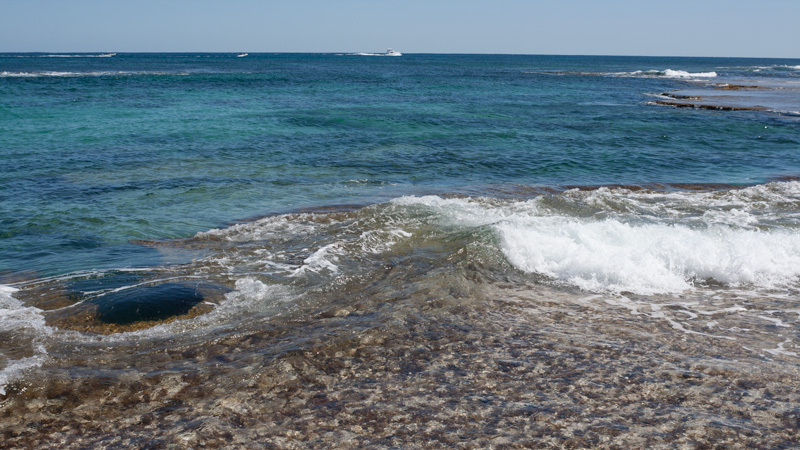 Rottnest Island has been a tourist attraction since the 1900s and to improve the natural environment for future generations it’s pretty important to minimize the impact of your visit. This means, keep rubbish with you until you find a rubbish bin (yes, food scraps too), do not feed the animals especially the Quokka, keep an eye out for reptiles on the paths while cycling and do not trample on vegetation and always stick to paths. If you are interested in the geography and bird life of Rottnest Island this website provides some interesting insight including research discovering a silver eye on Rottnest Island 3 years after being tagged in Herdsman Lake! 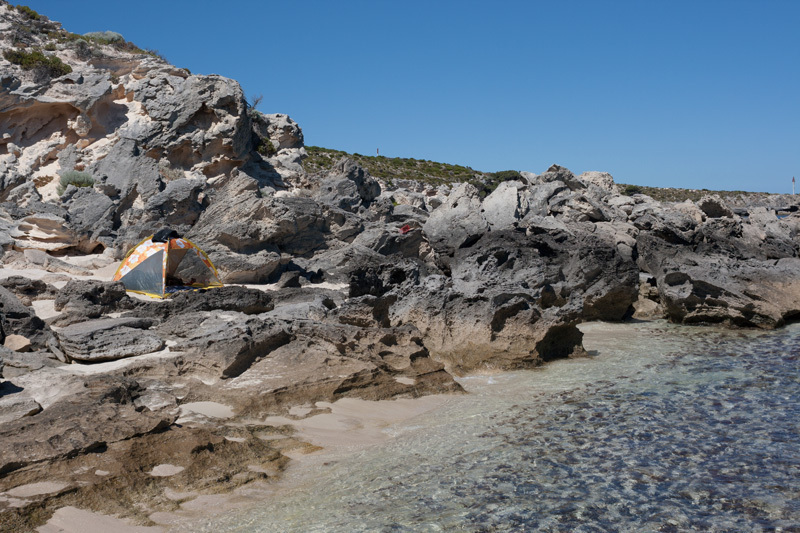 Have you seen our other posts on Rottnest Island? It’s such a great outing anytime of the year. Really interested to read about the migratory birds, never occurred to me to think about why they have such long legs, but all makes sense now. I’ve never been anywhere in Australia, but I love reading anything about it as Australia is one of those bucket list places for me. I like the beach tent. I’ve never seen one before, but I like it! I’ll have to look into getting one of those. Great post. It surprised me that you said the water was really cold after you said there were tropical fish about. The island looks beautiful and is yet another place I need to add to a list. Great photos too. WOW! Loved this place. I’m a bit jealous of how you guys spent the last day of 2016, but that gives me an idea for this year. Great post, really informative and interesting! Loved your pics as well, Australia has never been on my radar but it sure is now! I have not been to this picturesque island though I have spent lot of time in Australia and have been to Great Barrier Reef , too. Enjoyed your post with stunning views. The beaches off the West coast of Oz looks amazing. I have family from Perth and their holiday photos on the coast always looks amazing. I can’t believe the water was ice cold over there, but the snorkelling spots must provide amazing marine life as its off the Indian Ocean. We will be in the area in about a years time and this has inspired us to visit! Great information on the bike ride this is right us our street 🙂 thank you so much and your photos are brilliant! We’re really excited. Woow! Sounds like quite an adventure camping on the rocks. The aerial picture of the lakes looks quite interesting. And your floral printed tent is so pretty. 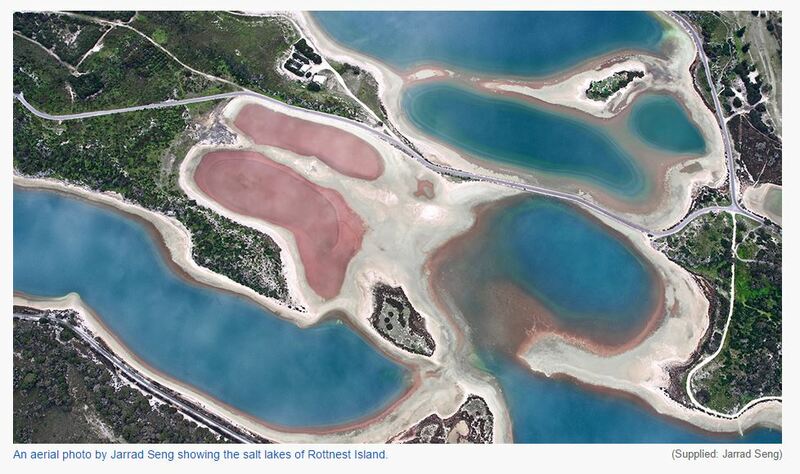 Wow Rottnest island looks amazing! How special that you were the only people there in the morning, I want to dive right into those gorgeous waters. 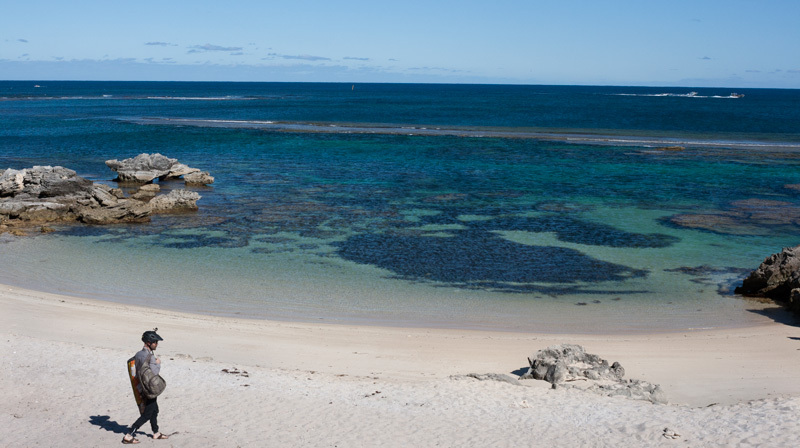 Nice virtual tour of Rottnest Island. Got some nice pictures that add to your detailed writing, but was surprised you didn’t include a picture of the classic Quokka! Amazing post, nice photos and blessing time to there. Australia is on my bucket list from years! Would love to visit Rottnest Island. We’ve only explored the east coast but hoping one day to see the rest of Australia. Looks so beautiful and serene there. The pizza looked yummy!!! I seriously need to learn how to bike hahaa. And your photos and and Jarrad’s aeiral shot look absolutely unreal! What a beautiful place to go cycling you have chosen! I really like the deserted beach where you have stopped to enjoy the nature for a bit. You can tell the water is very cold even from the photos. Shame the pink lake was dry though and you didn’t get to see it. I love that this area is car free! I wish more natural areas were like that to allow more silence when hiking or biking. Looks beautiful! i have an American friend in australia now studying at Monash and hes been gradually exploring the country. I will share this post with him. Sweet! I really enjoyed reading your article. I guess there are no “local inhabitants” on the islands since it is car-free? This fact really convinced me that I wanna cycle there as well! I have been to Perth, but unfortunately, I did not have a chance to go to Rottnest island due to a lack of time. I cycled around Kings park instead! Next time: Rottnest for sure. If you like cycling you can check out my post about cycling on an island in Singapore!